Sew what's cooking with Joan! : Left overs! For breakfast? I just can't get enough turkey when Fall comes along!! I start off by buying turkey breast in September, trying different preparations, move on to thighs for casseroles or curry. 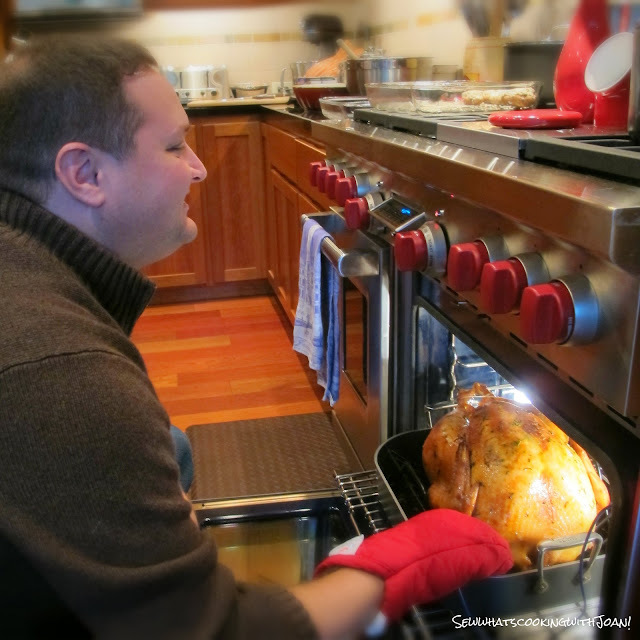 For my family, it doesn't end with Thanksgiving. Turkey for us, is the gift, that just keeps on giving! What's your leftovers style? The obligatory turkey-stuffing-etc. sandwich? Throw an egg on those brussel sprouts? Repurpose the mashed potatoes into a family doughnut recipe? 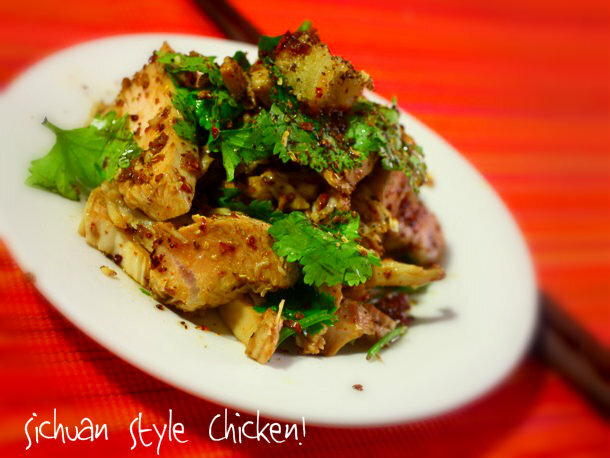 Or if you're craving spicy, ever tried a mouth-numbing Szechuan-style turkey dish? I dug up some leftovers recipes, so you can make the best of the gift that keeps on giving. Heat a pan on medium high, melt butter until it starts to bubble. Spread a nice even layer of dressing on the pan and press it down so that it makes a good contact with the hot surface. Leave it alone so crisps nicely. In the meantime, warm leftover gravy in a separate saucepan, add heavy cream to desired consistency, add chopped herbs to flavor. Let gravy cook but not boil. Flip dressing and crisp on other side. 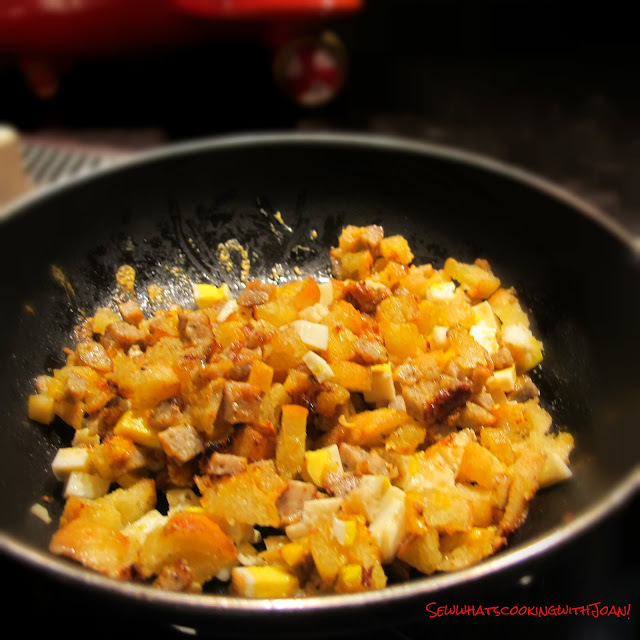 While dressing is crimping, cook eggs to your liking. Plate dressing and add eggs in top, drizzle (or ladle) gravy as desired. Enjoy! Once turkey and garlic have warmed through, add eggs, spinach and Brie. Scramble until spinach starts to wilt and Brie just starts to soften. Plate and top with a bit of fig compote (or even leftover cranberry sauce) and enjoy with toast. Having lived in Mexico for several years, one of our favorite lunches was Tortilla soup. 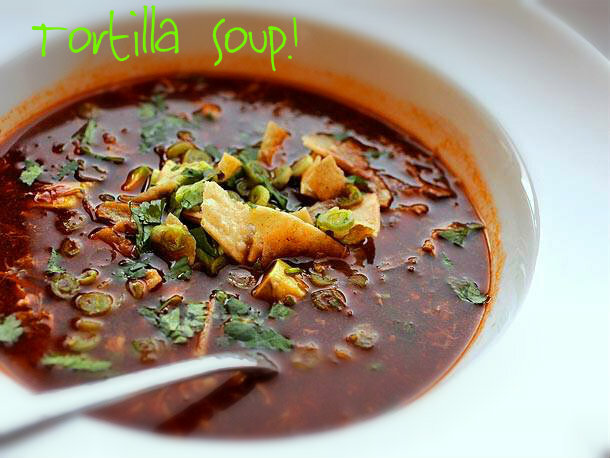 Our daughter Laura could almost live solely on good Tortilla soup! Turkey and chilies go remarkably well together. Heck, the turkey's even the national bird of Mexico, or at least it would have been had the Golden Eagle and a half dozen other birds in line for the job in front of it had posed slightly less imposing silhouettes on a coat of arms. Hahaha! It is, however, widely consumed in Mexico. Heat peanut oil/canola oil to 350°F in a dutch oven or wok over high heat. Add tortilla strips and fry, agitating with a metal spider or slotted spatula until strips are crisp, about 2 minutes. Transfer to a paper towel-lined plate, season with salt, and set aside. ~ You can use store-bought tortilla strips or crumbled tortilla chips if desired. For a milder flavor, remove one ancho and one pasilla chili and replace 1 cup chicken stock in step three with 1 (14.4-ounce) can of diced tomatoes with their juice or Ro*Tel tomatoes. ~This dish can also be made with sliced pork or chicken. To make chili oil, combine 1/2 cup crushed red pepper flakes (preferably Chinese) with 1/2 cup oil in a small saucepan. Heat until lightly bubbling, then remove from heat. Allow to steep several hours or overnight. Chile oil can be stored in refrigerator for up to three months in a sealed container. 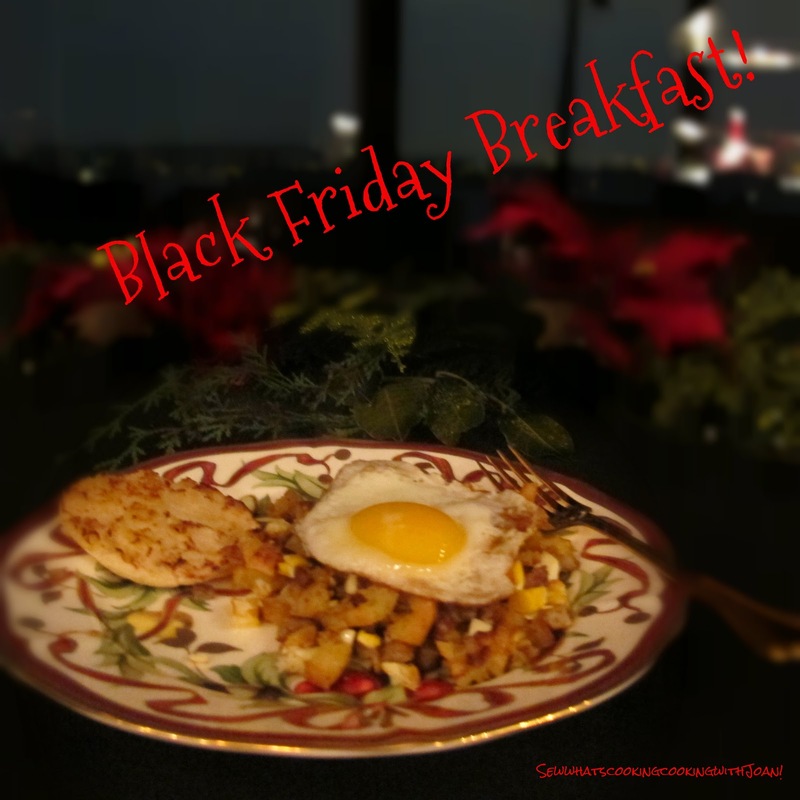 Black Friday is here!! If you like to partake in that "Sport" I wish you good luck!! We are doing our traditional girly brunch with a bottle of Veave Clicquot of course!! Then Wee Bear and I will host dinner Friday night to accommodate our 7 month old Grandchild's sleep pattern and allow her Mom and Dad to relax with their siblings. Saturday, bowling with the cousins and kiddo's! I have been busy working on a new Christmas tree, a little more edgy than our past trees! 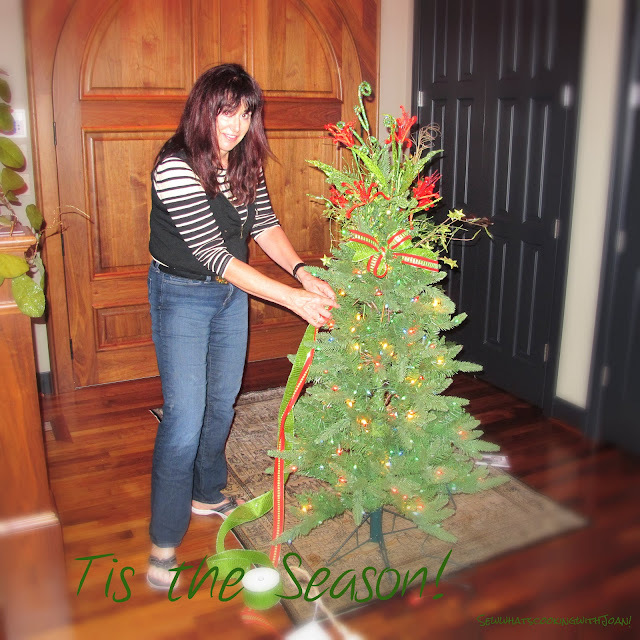 And, I will share my decorating tips on future blogs! 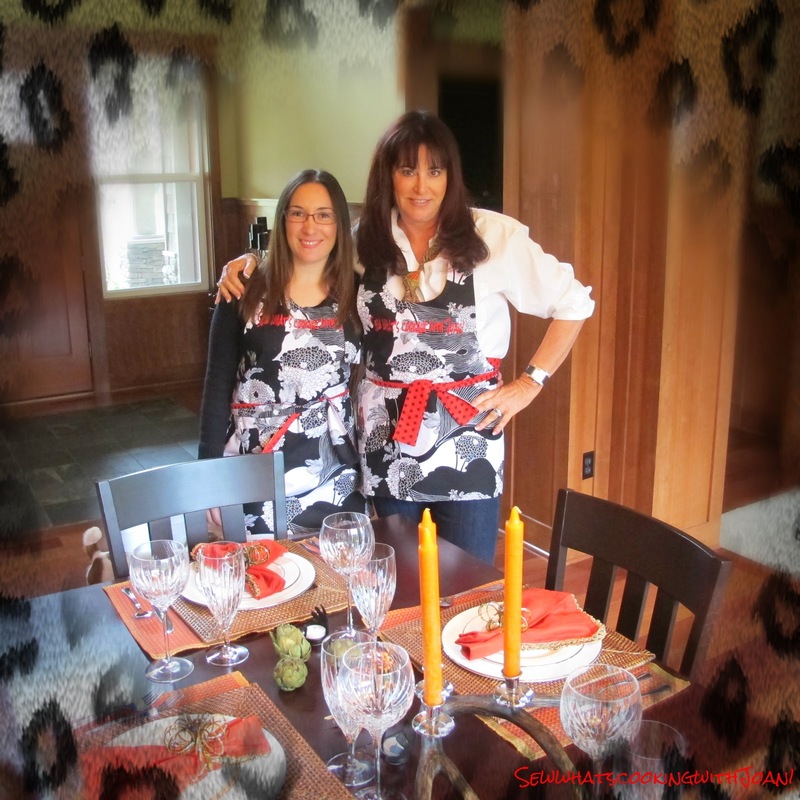 Sew Whats cooking with Joan! An apron made for Sweet One and I by our friend Fawn, who has an embroidery business. She sews the apron out of any fabric you may want, then embroiders anything you want on it! If you are wondering what to get for a hostess gift, or a gift for Aunt Marge...click on the icon on the right side of this blog and you will be directed to Fawn's web site. she can customize any idea you have, or give you some creative ideas to thrill and delight! 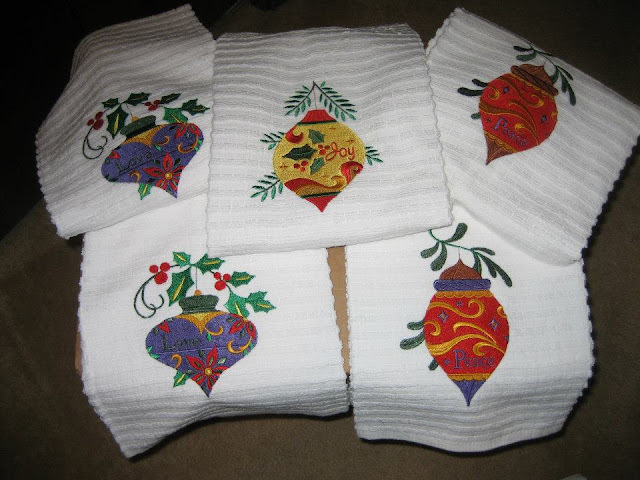 More of Fawn's Embroidery, I bought two sets of three, just beautiful for hostess gifts, tuck one around a bottle of nice wine, in a decorative bag! We have a action packed weekend planned with family! See you on Monday with a sweet blog with my Granddaughter and I tackling a English Gingerbread cookie! Enjoy your weekend no matter what you have planned! Everything is custom, so call or email to discuss your wish list. Turkey tortilla soup sounds awesome!